Beachfront Property - Please read our reviews! 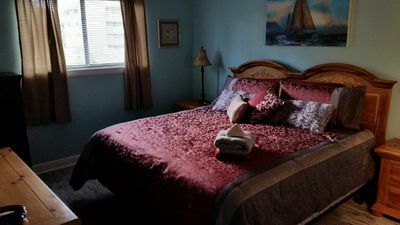 Welcome to Coastal Comfort Properties. 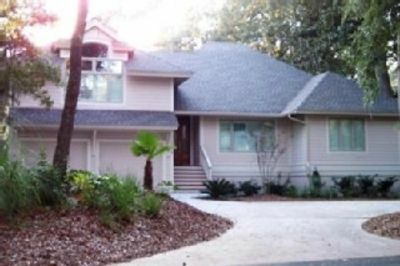 You are viewing our one bedroom villa we call Seabreeze located less than 150 yards from the ocean on Hilton Head Island. Please make sure to read our guest reviews. ** FREE Wireless internet provided. 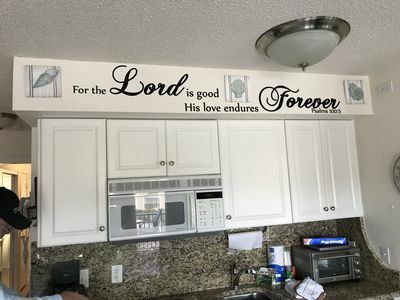 This is not provided in all villas. Beach chairs also provided for your use. 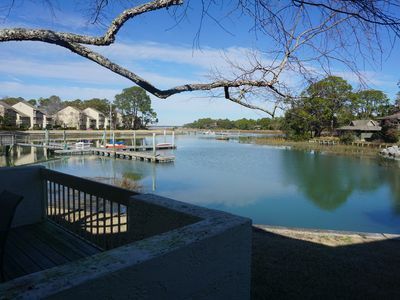 Seabreeze is located in the complex of Hilton Head Island Beach and Tennis Resort. Staying on the third floor of the desirable 'B' building, you will be close to the pool and have a great view of the ocean from the balcony. An elevator is available in the building if needed. 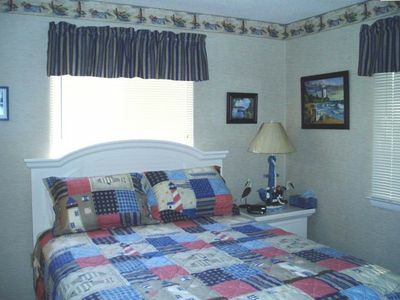 The bedroom has a queen size bed and in an adjacent area there are two built-in bunk beds for the children. The living has a queen size pull out sofa. The villa can accomodate 4 people (2 adults and 2 children) We are not set up for more than 2 adults. 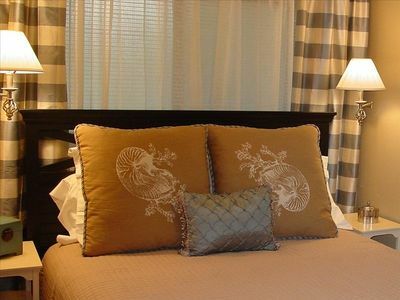 The villa has been completly renovated with all new furniture, appliances, flooring, linens and towels. Flat screen television in the living room and bedroom, DVD/CD player in the villa when you are not out enjoying all the island has to offer. 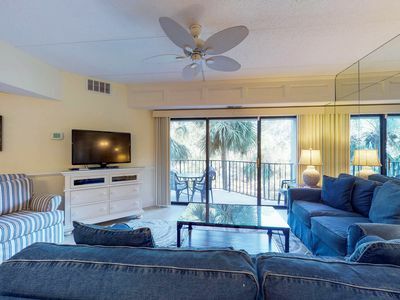 Hilton Head Island Beach & Tennis Resort boasts an outstanding, family-friendly complex with something for every vacationer. 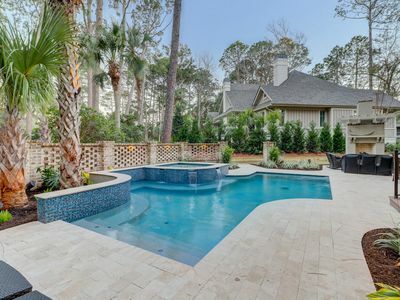 With the largest oceanfront pool on Hilton Head Island, ten lighted tennis courses, and access to some of the finest golf courses in the world, you're sure to find a host of activities to keep you happy. During the summer, the resort has a very well planned daily ativity program for the children. 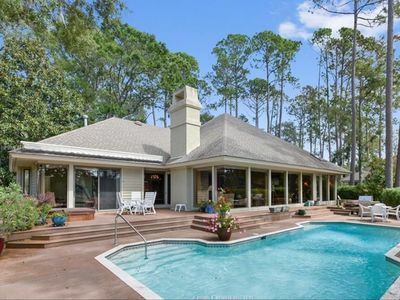 This mid island location is an ideal location as you have easy access to everything on the island. Please use the link below for additional photos and information. BEDROOM: Newly painted bedroom, brand new queen size bed with all new luxury linens. Flat screen television mounted to the wall on a swivel for easy viewing. You can also swivel the television to view from the bunks. 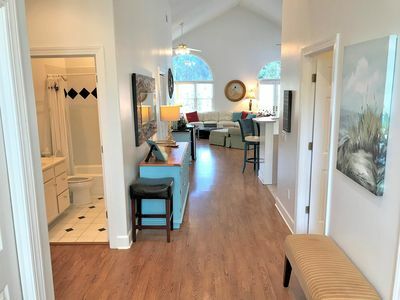 Bamboo floors, full length mirror, and other luxury amenities. BUNK BEDS for the children: Always a hit! BATHROOM: Completely redone with fresh paint, tub/shower upgraded. Beautiful tall storage shelf for towels and your personal items. White finishes and brushed nickel fixtures complete the updated bath. 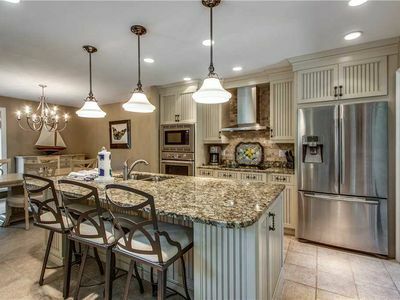 KITCHEN AREA: Fantastic new kitchen with all new stainless full size appliances. 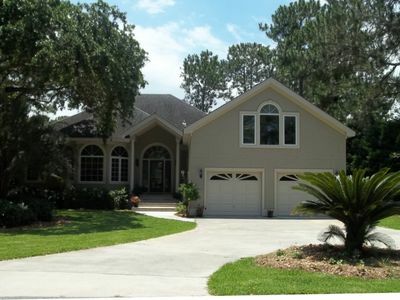 Granite countertops and glass tile backsplash complete the updated finishes. 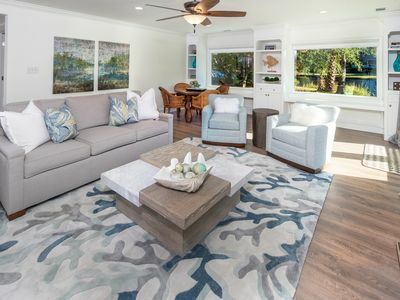 Bamboo floors and sisal rugs add a contempory feel. The kitchen is equipped with all new dishes, cookware, utentsils and small appliances. 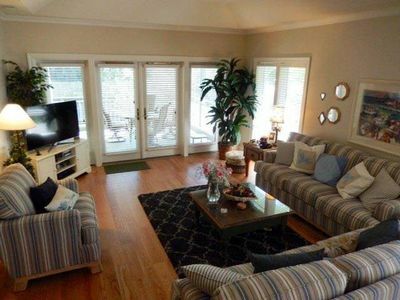 LIVING AND DINING AREA: Here you will find a fantastic built in banquette, wonderful pillows and comfortable seating. 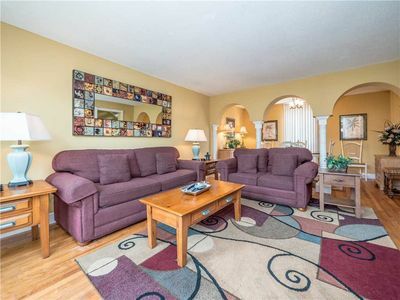 A 37' flat screen television, DVD, and VHS provide a great place to watch that favorite movie. We have a library of children's videos available for you to enjoy as well. You will find a desk area with high speed internet access as well. WASHER and DRYER: The washer/dryer room is located on the second floor in our building. BALCONY: Two chairs along with a small bistro table provide additional space to enjoy a meal or just sit back and enoy the view. STORAGE ROOM: We rent a small locked storage room close to our villa, just down the hall, and provide beach chairs, umbrella and beach toys for the children. This is a great area to store your suitcases during your stay as well. 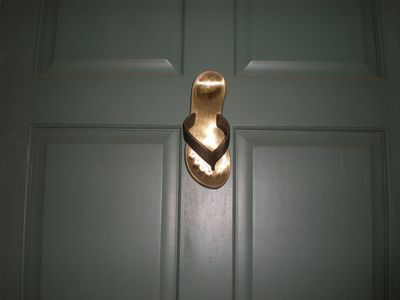 Keys to storage are provided in the villa. Thank you for looking at our villa. We hope to hear from you. 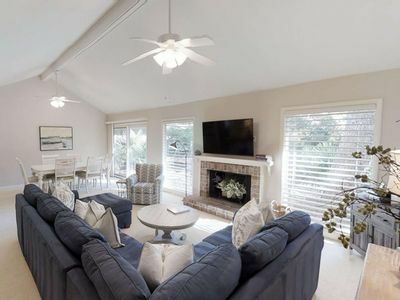 Beautiful oceanside villa complex that is just a short walk to the beach! 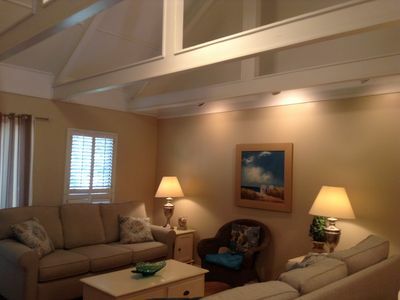 4th ROW OCEAN COMPLETELY RENOVATED 2 MIN WALK TO BEACH. REASONABLE RATES. 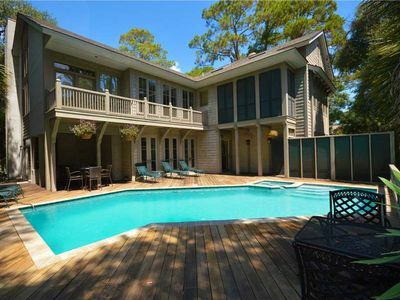 Stunning Oceanfront Home w/ Pool, Elevator, Large Deck, Easy Beach Access! 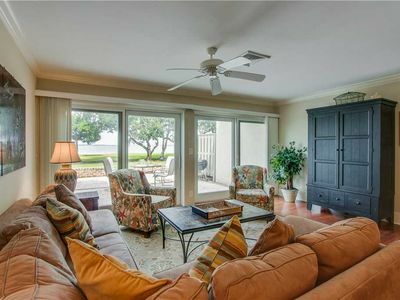 705 Schooner Court | Sound Views | Close to Harbour Town Shops & Dining | Bike or Trolly to Beach!